Last year I marked the turn of the decade with what I called the first, maybe annual, but definitely not prestigious Muse-ette Awards. The fact I'm doing another edition this year means at least the annual bit is now true! If 2009 was what I called "a good year for the bike world" then 2010 has turned out a bit differently. It started out well, had a great middle and a pretty good end, racing-wise, but unfortunately the whole year has been tarnished, like so many before it, by the spectre of doping. Yet again we've had to witness great races nullified by positive tests or besmirched by unworthy, unrepentant cheats. Best Stage Race: Naturally one thinks of the Grand Tours when looking for a candidate for the best stage race but this year, despite all of them being up there among the most compelling races ever, all three have had shadows cast over them. First there was the tarnished figure of Basso taking pink in Italy, then Beef-gate, then not one but two high profile positives from the Vuelta. So this year I've decided to give the award to what (I hope) is most likely the cleanest, purest stage race around, the Junior Tour of Ireland. For over thirty years this great race has been a nursery for future champions and it deserves all the recognition that can be bestowed on it. Perhaps more than ever this year when it survived through the hard work and perseverance of a dedicated team, despite the loss of it's title sponsor. Best Stage in a Grand Tour: I know I'm kind of contradicting what I said above but, despite the later problems, there were some epic individual stages this year. For me this one has to go to stage 7 of the Giro to Montalcino. It was like going back in time to the early days of the sport seeing Cadel et al, caked in mud, battling it out, without the interference of team instructions, over the Strada Bianche. Honourable Mention: In a similar vein stage 3 of Le Tour to Arenberg was an epic, dusty, dramatic day with winners and losers galore. That particular day was personally special seeing as I was actually there, standing for the first time on those hallowed pavé. Best One Day Race: Tour of Flanders. Who wasn't awestruck by the sight of Cancellara and Boonen simply riding away from the rest on the Molenberg, 40k plus out from the finish? And then, in a straight head to head battle up the Muur, Spartacus simply powered away from a helpless Tom to take a great victory. Honourable Mention: Tour of Lombardy, where Gilbert left the rest for dead in appalling conditions before having time to point out the number one on his bike with over 1km to go. Best Finish: Cadel Evans at Huy. In a year when he did the Rainbow Jersey proud, the highlight for me was the sight of Cuddles powering up the Mur De Huy to win the Fleche Wallone. Sheer determination oozing from his every muscle, he left Contador and the rest for dead. Best Irish Rider: Tough one to call this year, so I'm going to bottle it and give the award jointly to the pedalling cousins, Nico Roche and Dan Martin. Nico for his magnificent Tour and Vuelta rides and Dan for his wins in Poland and Japan. Honourable Mentions: Matt Brammeier for taking on the big boys to nab the Irish title and then turning it into a contract with HTC and Orla Hendron, our latest World Champion after taking the Masters Points race. Best Young Rider: Felix English I know it's a bit churlish of me, but for an 18 year old to take on Sir Chris and win, even if His Knightship was looking the other way, deserves a pat on the back! Best Celebration: Michael Matthews. It's always great to see raw joy on the line but when it's a 20 year old after just bagging a World title in his home country it gladdens the heart even more. Most Embarrassing Result of the Year: For the second year running this gong goes to Piti Valverde for winning the Tour De Romandie when the dogs on the street knew he was about to be banned, finally, for the Puerto goings on. (Dis)Honourable Mention: Who among you wasn't sickened at the sight of Vino crossing the line at Liege. And then he rubbed it in with his half-hearted "apology". Eugh!! The George Lee What Was I Thinking Award: Lance Armstrong, for what might turn out to be the most ill-advised ego trip, sorry I meant comeback, in the history of sport if Floyd Landis has his way. BTW Lance, posting snide tweets about Jeff Novitsky using your One Ball pseudonym isn't really helping you much. The Tiger Woods Award for Most Stage Managed, But Still Really Awkward, Press Conference: Alberto Contador for the double whammy of p***ing off the cycling world and the entire Spanish beef industry in one fell swoop. If it all turns out to be true he can reel off as many "zero, zero, zero"'s as he likes, his credibility will still be in the gutter. But then again he wriggled out of Puerto so who knows how it'll all end. The Thierry Henry Cheat of the Year Award: Another joint award goes to Alberto Contador who should have had the fish and Ezequiel Mosquera for ruining a great Vuelta. (Dis)Honourable Mention: Vania Rossi, the Szczepaniak brothers, Bernucci, Frei, Li Fuyu, Bosisio, Pellizotti, Prado, Valjavec, Larpe, De Bonis, Caucchioli, Serrano, Axelsson, Staite, Sentjens. Sevilla, Dapena, Benta, Colo, the Rui Costa brothers, etc, etc. The Grassy Knoll Award for Most Ridiculous Conspiracy Theory: Davide Cassani for triggering the "Cancellara used an engine" stories on Italian TV. For the UCI to actually start checking bikes for engines while simultaneously not getting around to telling the world that the Tour winner had tested positive for angel dust just compounds the silliness. The No News is Bad News Award: Yet another joint award (I'm really indecisive tonight!) goes to Vancansoliel and Christina Watches for proving that some sponsors do see a value in the column inches the cheats generate. The employers of Ricco and Rasmussen respectively must be hoping that a Festina-style sales jump happens to them too. The UCI Award for Making It Up As You Go Along: UCI for making it up as they go along. When is a Pro Tour not a Pro Tour? Because it's my blog I'm adding two new awards this year. The first is the My Best Day on a Bike This Year Award which goes to the 15th August. That was the day I rode the Inishowen 100, a day of blistering sunshine, beautiful scenery, tough climbs and good legs. It doesn't get much better. The second is the My Worst Day on a Bike This Year Award which goes to the 27th August. That was the day a Golden Retriever called Max decided to run across the road just as I was passing. He didn't use the Green Cross Code and I ended up with a broken pelvis. JJ McCormack, 84, Multiple Irish Champion, Administrator and Race Organiser but most of all one of the biggest, most respected, characters the sport has seen and a great friend. David Hourigan, 38, Manx International winner and former Irish international, found dead in a hotel in Thailand. Laurent Fignon, 50, Not just the guy who lost the Tour by 8 seconds, but the guy who won it spectacularly on his first two attempts. Succumbed to cancer on 31st August. Joe Daly, 89, Dundrum bike shop owner and passionate supporter of the sport for many, many years. Franco Ballerini, 45, Twice Paris Roubaix winner and Italian national coach, tragically killed in a rallying accident in February. Txema Gonzalez, 43, Team Sky soigneur struck down by a mystery virus during the Vuelta. Fortunato Bernardi, Rosario Perri, Francesco Stranges, Vinicio Pottin, Giovanni Cannizzaro, Pasquale De Luca and Domenico Palazzo, from 35 to 58, a group of Italian clubmates from Lamezia Terme mown down in early December by a 21 year old driver who was allegedly under the influence of marijuana. Armando Borrajo, 34, Former Argentinian National Champion took his own life on December 18th, shortly after he was allegedly kidnapped for a short period. Aldo Sassi, 51, legendary Italian coach, famous for vowing to only work with dope free riders, who raised eyebrows by agreeing to take on both Basso and Ricco was lost to a brain tumour in December. Finally, once again, thank you for reading the muse-ette in 2010. I wish you all a very Happy New Year and many enjoyable miles in 2011. 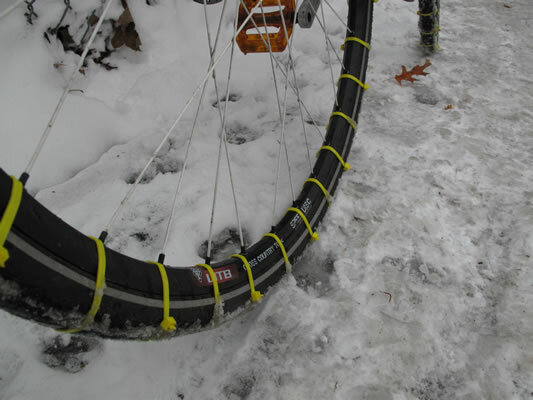 You have to love this cheap and simple technique for making your bike snow-ready, from the Dutch Bike Co guys in Seattle. Cable ties as snow tyres! Brilliant! It's always hard to find anything to write about at this time of year, and now is no different. Outside is covered in snow so I can't tell you about my training rides, there's no pro racing so I can't write about that and the Contador "did he, didn't he" debate is going nowhere fast. So this week, as I was slipping to the shops on my mountain bike, I got thinking about cyclo-cross, an often forgotten aspect of our beloved sport. I have to admit cross was never really my thing. I can't quite put my finger on what it was about the cold, muddy, technical, fast, lung busting efforts involved that I never quite mastered! The post Christmas novelty event run by my club, Eagle CRC, was as far as my cross career went. But that doesn't mean I don't appreciate this most spectator friendly event. And some people take it very seriously, especially the Americans and the Belgians. So here's two YouTube clips that'll take you into their world. Keep and eye out for Sven Nys bunny hopping the ditch - wow!